As a record-number of holiday travelers hit the road, Boston will be especially hard hit this week, according to AAA’s travel forecast. However you celebrate, we hope you enjoy a festive holiday season, filled with friends, family, holiday events or volunteering. But most of all, here at Breakstone, White & Gluck, our attorneys hope you commit to travel safely during the holidays. While it’s the season for giving, Thanksgiving to New Year’s brings some of the most dangerous days on the roads. AAA is forecasting a record-breaking 112.5 million holiday travelers – or 1 in 3 Americans. This represents a 4.4 percent increase over last year. More than 102 million will travel by car, the highest number in 17 years. The forecast holds bad news for Boston though. On Wednesday afternoon, we could end up with one of the longest commutes in the nation. Plan for Boston holiday travelers. AAA and INRIX forecast this Thursday, Dec. 20th, will be the most congested day nationwide. Boston is on a list of 10 holiday hot spots, with the worst travel expected on Wednesday, Dec. 19th. 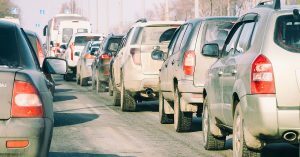 The absolute worst time to drive is 3:30 to 4:30 p.m. that day and you can expect the commute to take 3.5 times as long. It’s hard to believe the forecast is so terrible. It’s based on historical data and recent travel trends. Unfortunately, this heavy traffic won’t just impact those starting their holiday commute; it will also challenge workers, school buses, delivery services and just about all of us. Make a plan. Take public transportation if you can. Adjust your work hours if your employer allows it. Services like Waze and Mass511 can help you navigate and take away some of the stress. Buckle up. Wear your seat belt at all times. When driving others, ask if they are buckled up before you start moving. People really need the reminder. Even after years of safety campaigns, nearly 10 percent of Americans are still not wearing seat belts, according to the National Highway Traffic Safety Administration (NHTSA). In 2016, seat belts could have saved more than 2,400 people killed in car accidents (Source: NHTSA). The day before you travel, also take time to check your children’s car seats, so they are properly secured. Plan enough space for holiday gifts. When traveling with gifts or food, make sure you leave enough space so you can see through your windows. Watch your speed, especially near pedestrians. Speeding is involved in one-third of all traffic fatalities, according to the NHTSA. It is also a leading cause in car accidents which injure pedestrians. Commit to traveling the speed limit or slower if you need to adjust for weather conditions, dark roads or unfamiliar areas. Have patience in parking lots and remember, during the holiday season, pedestrians may be out later at night. Drive sober. If you celebrate outside your home, our suggestion is to skip the alcohol and focus instead on all you are grateful for this year. If you plan to drink, choose a designated driver whom you trust not to drink. As a backup, install the Uber and Lyft apps on your phone. Drunk drivers killed 10,874 people in motor vehicle crashes in 2017, representing 29 percent of all traffic fatalities in the U.S., according to the NHTSA. Here in Massachusetts, drunk drivers caused 34 percent of all traffic deaths. As personal injury attorneys who represent those injured by drunk drivers, we know firsthand that when someone is killed by a drunk driver, nothing is ever the same for the family. Drunk driving accidents are senseless, entirely preventable had the driver just made a better decision. As for drunk drivers, they can be criminally charged and expect to face a civil lawsuit, as can others in certain cases, including bars and restaurants in liquor liability cases. Marijuana will be in greater supply this year, after retail stores have opened for recreational marijuana sales in Massachusetts. Use good judgment. Do not consume marijuana when you are driving. Users are about 25 percent more likely to crash than other drivers, according to the Centers for Disease Control and Prevention. No distracted driving. We cannot say it enough: it’s critical to put your cell phone away when you are driving, especially in heavy traffic. Tell your loved ones your phone is off the hook until you stop driving and turn your engine off. Stay committed to that. Don’t engage in texting while driving, reading e-mail or checking Facebook when driving. Have your directions ready in advance. If you are driving long distance with children, make sure you have snacks, books, coloring sets or games prepared. If possible, drive with another adult so they can respond to your children and make an emergency call if necessary. Finally, plan ahead and decide where you want to take rest breaks. Emergency supplies. Do everything you can to ensure you reach your destination safely. Carry cash, a credit card and an emergency kit containing: a mobile phone charger, a first-aid kit, water and snacks, a flashlight and extra batteries, warning flares, jumper cables and a basic tool kit. And don’t forget ice scrapers, shovels and blankets. For more than 25 years, Breakstone, White & Gluck has represented those injured by car accidents in Massachusetts. Our Boston car accident lawyers are known for our top results for clients and their families. We have consistently been recognized for our results, including by Massachusetts Super Lawyers, Top 100 New England Super Lawyers and Top 100 Massachusetts Super Lawyers. If you have been injured, learn your legal rights. For a free legal consultation, contact Breakstone, White & Gluck at 800-379-1244 or 617-723-7676. You can also use our contact form. It’s always a tragedy when someone leaves a bar after a night of drinking, steps in his or her car, and causes a motor vehicle accident resulting in personal injury. For years, that tragedy was compounded by Massachusetts law, which let bars and restaurants operate without liquor liability insurance. Like other businesses, Massachusetts restaurants and bars have traditionally carried general commercial liability insurance covering on-site problems, including slip and falls and other injuries. But this insurance offers no assistance to drunk driving accident victims. In late May, Massachusetts lawmakers corrected this and passed a law requiring restaurant and bar owners to carry liquor liability insurance. Establishments must carry a minimum of $250,000 per person/$500,000 per accident coverage. In other words, policies must provide a minimum $250,000 for bodily injury or death of one person and a total of $500,000 per incident involving bodily injury or death. Innocent victims of drunk driving accidents still face the traditional hurdles in proving their cases against bars. One hurdle is strong juror bias. Juries do not hesitate to hold the drunk driver responsible. But juries are often reluctant to blame a drinking establishment for over-serving a patron, even though the law is perfectly clear that a bar has a legal duty to not serve someone who is intoxicated. Restaurants and bars seek to avoid liability for over-serving patrons, and they typically claim they did not recognize that the patron was intoxicated. The recent Massachusetts Appeals Court case of Rivera v. Club Caravan, Inc., 77 Mass. App. Ct. 17 (2010), reviewed the legal standards for “dram shop cases.” Generally the plaintiff must prove the patron showed outward signs of intoxication by the time he or she was served her last drink. However, circumstantial proof can also be sufficient. If the patron had consumed excessive quantities of alcohol, a jury can draw an inference that he would have been visibly intoxicated. So, where a patron is served fourteen drinks in two hours, as in the Rivera case, or was served six or more white Russians, as in another Massachusetts case, the circustantial evidence is strong enough. Click here for the full text of the law. Tagged: "drunk driving accidents", "liquor liability insurance", "Massachusetts bars", "Massachusetts personal injury lawyers", "Massachusetts restaurants" and "wrongful death"